Immortals. One movie that I’d really been looking forward to in the November of 2011. I’m a huge fan of Greek mythology, and I really wanted to see what this movie would be like, especially after the terrible dreariness of that-which-shall-not-be-named-but-shall-nonetheless, Clash of The Titans. I suppose I should have known better. I shouldn’t have put so much in Hollywood where stories like this are concerned. But I did, and I paid for that… naivete. Immortals shall live on as one of the worst movies of this century. It took a brilliant concept, and then totally messed it up, on several different levels. It was at least as disappointing a movie as Clash of the Titans, if not more. Here’s my (reposted) review where I go into a bit more detail. Hollywood has long been obsessed with greek mythology, resulting in a slew of films on the wide-ranging topic over the years. The list includes films like Jason and the Argonauts (1963), the original Clash of the Titans (1981) and its terrible remake (2011), and Troy (2004). The obsession continues with Immortals which tells the story of Theseus, one of the greater demi-gods and heroes of the greek mythological cycle, and the son of Posiedon, god of the seas and earthquakes. A word of warning to the unwary: The film is terrible. That is, it is terrible in that for those who are familiar with the character’s history and his place in the mythologies, like me for instance. The writers have taken a very rich character and stamped all over his lore with a jackhammer. That’s how terrible I found the film. Let’s start with the criticism one by one. And maybe we will get to the few goods of this. Spoilers follow so be warned. What is Theseus best known for? He is the one who killed the Minotaur. That is one of the most enduring stories from Greek mythology. People the world over, in my experience at least, know more about this story than they know about Jason and the Argonauts. He is a character on par with Achilles, Perseus, and Heracles (Hercules) in popularity. So does Theseus kill the Minotaur in the movie, I here you ask? Well, yes and no. I see you are confused so I’ll explain. Theseus in the movie kills a giant, drug-crazed berserker who wears some kind of a helmet-like bull mask. At least tell us that the fight took place in a labyrinth? It takes place in a crypt which is part shrine and no actual labyrinth is found within miles of the structure. No, no, don’t recoil. This is Hollywood remember? Let’s move on to the gods. 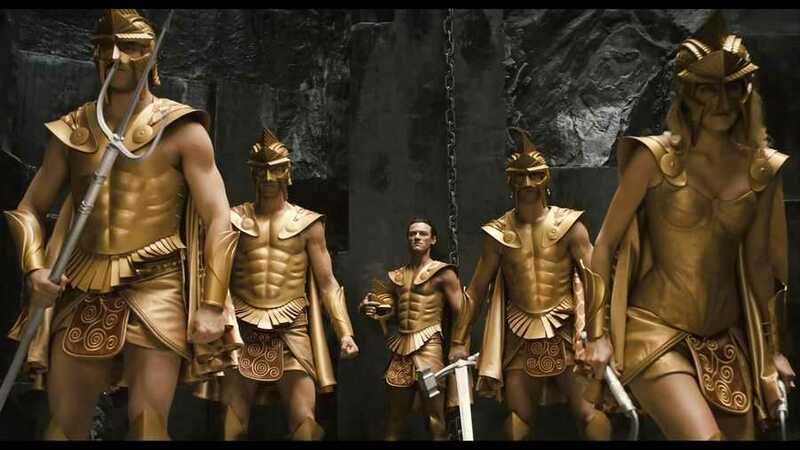 I hated the depiction of the Greek gods in this film. I was fine with their ‘soft’ portrayal in the Percy Jackson movie. I was fine with their sophisticated portrayal in the original Clash of the Titans. I was even ok with their portrayal in the Clash of the Titans remake. 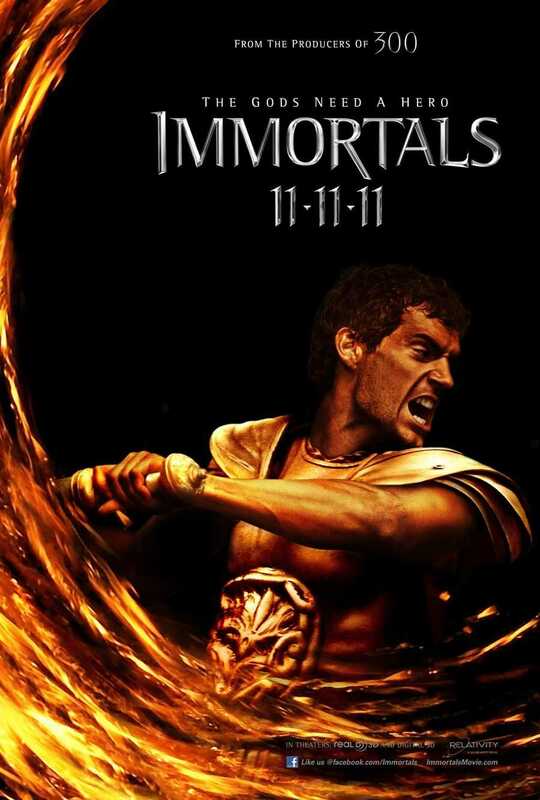 But I am definitely against their portrayal in Immortals. First off, they all wear the most ridiculous head-dresses. Second, it is a real pain to even distinguish who is who! Poseidon, armed with a frail-looking trident, was the only distinguishable god. Only later in the movie, during a tense stand-off do I realize that Ares was one of the gods in the film. Only after reading the movie’s wikipedia entry did I realize that the fourth male god in the film (after Zeus, Poseidon and Ares) was Heracles. Athena is the only female god shown. This was all very, very cringeworthy. If Athena never says the word father in the entire movie, you wouldn’t even know that it is her. And why is Heracles shown anyway? He was a demi-god, not a full god and spent almost all his life in one Greek city or other. And if the character in the movie really is Heracles, then I am Hades. And haven’t we had enough of the “gods shall not interfere in the affairs of the humans” shtick? This film takes that concept and butchers it in the execution. Zeus decrees that no god shall help the Hellenics (the greek people) against the Heraklion king Hyperion, as a god. If they break his decree he will kill them. And he does. At this point, I just wanted the movie to be over. It was a struggle to stay for the remaining time. The Titans also make an entrance. As if the plot wasn’t already full of gods, demi-gods, genocidal kings, unsure, unbelieving heroes and monsters and quests for relic weapons and all, we even needed these greatest of the gods. In the mythology, the Titans were the precursors to the more famous Greek gods and two of them were also the parents of the more well-known Greek gods. In the movie they are a bunch of black-skinned, naked, helmeted warriors who are locked up in a cage and with some sort of a rod in their mouths. They appear to be slaves. Except they are locked up in some random Mountain. And our genocidal king is out to free them so they may war upon the gods. I’d say my head was spinning throughout the movie, but it wasn’t so I’ll just say that all these made-up, Hollywood glittery details were giving me a headache. The movie is simply a terrible re-imagining of the Theseus heroic mythos. Nothing in it makes sense. The biggest evidence of that, if everything I have already mentioned isn’t enough which it isn’t, was the scene after Theseus is captured and forced to work in salt mines. I actually checked wikipedia’s entry for salt mines. The article is little more than a glorified stub but there is no mention of Greece in the article. Additionally, in one scene Theseus and some other prisoners are surrounded in what appears to be an outpost in a salt desert and only a few minutes later they are next to the Dark Seas, so named because they are laced with oil. I’ll stop my rant there. Moving on, if that is all the negatives of the movie, then what are the positives? The only positives in the movie are the actors themselves. Freida Pinto as Phaedra the Virgin Oracle (her character has also been changed from its mythological roots) and Mickey Rourke as Hyperion are the only ones I’ll commend here. These two are the only ones who definitely got their characters across well, even though these are Hollywood reimaginings. Rourke plays his part fantastically. You can definitely feel his anger, his frustration, his inherent violence et all in every scene he is in. In once scene he is eating fruit and talking to a deserter. In the next he consigns the same man to have his man-parts crushed by a hammer. In one scene he is railing against a priest for the man’s faith in uncaring gods. In the next scene he topples a brazier on the man, burning him alive. It was a shudder-inspiring performance. Freida Pinto plays Phaedra quite well. She has the necessary charm and grace and beauty to fit the character to a T. Her performance is another I’d commend because you are never bored by her performance. Cavill on the other hand is a hit and miss. Theseus in the movie is someone who doesn’t believe in gods until he has an epiphany prior to killing the ridiculous Man-Minotaur. The script was definitely lacking, but Cavill didn’t quite get the apparently brooding, unsure Theseus right. Nor did he get the fierce, leader-in-making aspect right. His speech to the Hellenic troops at the beginning of the showdown lacked the necessary fire. He was good in other scenes though, especially when squaring off against Hyperion or when he talks with Phaedra or his mother or his mentor. Luke Evans failed at conveying the domineering, supremely serious side of Zeus. Zeus is essentially the King of the gods in the mythology, the one who killed his own father because his father tried to kill him as a baby. And he married his own sister, Hera who became the queen of the gods. And he had a daughter with another sister, Demeter. And in a weird twisted way that is intrinsic to Greek mythology, Heracles was Zeus’ son and great-great-great-grandson or something at the same time. Twisted, I know. But I digress. Luke Evans should have taken some tips from Sean Bean’s Zeus in the Percy Jackson movie, or Liam Neeson’s Zeus in the Clash of the Titans remake. He just didn’t have the gravitas to play this character. The other characters were also, more or less, hits and misses too. The only standout would be the thief Stavros, played by Stephen Dorff. He was entertaining. In the ending, the film is very unsatisfactory. After the entire plot so far revolving around the mysterious relic-weapon known as the Epirus Bow, it is not even used in the final duel between Theseus and Hyperion! And all the gods shown thus far in the film, bar Zeus, are killed by the Titans. Or, in the case of Ares, by Zeus himself. Sorry, what? At the risk of repeating myself, I will say again that the film is terrible and unsatisfactory. 3D will not be worth it because the film itself is that bad. Going to the cinema, just to see two good actors out of several, is not worth the price of admission even. Posted on February 7, 2014, in Movie Reviews, Review Central and tagged Apollo, Ares, Athena, Film, Film Review, Freida Pinto, Greek Gods, Greek Mythology, Henry Cavill, Immortals, Isabel Lucas, John Hurt, Luke Evans, Mickey Rourke, Movie, Movie Reviews, Poseidon, Review, Review Central, Stephen Dorff, Tarsem Singh, Theseus, Universal Pictures, Zeus. Bookmark the permalink. 1 Comment. A huge disappointment of a movie, agreed.